Designed for flat panel TV/monitors from 30-61" or up to 150 lbs, the versatile Chief TPM-2136 accommodates a large range of pole dimensions, includes security options, and provides flexible features to achieve a custom installation. Perfect for exhibit, retail and digital signage applications, it also includes Chief's Q-Latch mounting system to secure the display with a lockable latch. Attach displays in portrait or landscape orientation. Install in portrait position and use tilt adjustment for side-to-side pivot. 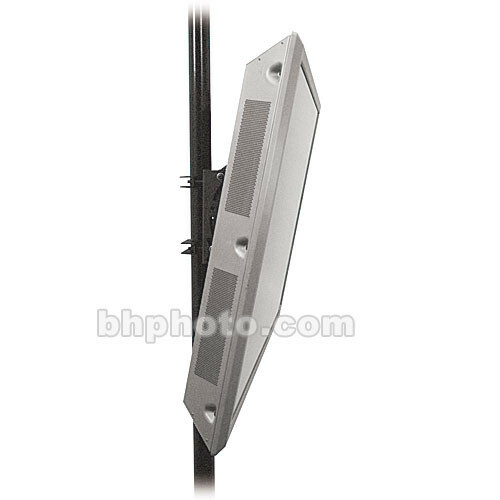 Ultra low-profile, the mount sits snugly against poles for an integrated look. Accommodates a wide range of pole dimensions (up to 6" OD) to make a custom installation. Durably constructed with heavy-duty steel and lock-down tilt. Q-Latch Mounting System offers quick connect/disconnect (no tools needed) and secures the display with a latching flag. Integrated security allows the display to be locked to the mount by adding a padlock. - Exclusive Centris Select tilt mechanism (+/-15°) lets you select the perfect tension for your screen's center of gravity to achieve smooth fingertip tilt. Screen angle stays set until you decide to re-adjust. Box Dimensions (LxWxH) 39.5 x 20.0 x 5.25"